Watch a demonstration Click Here! Our film history is in great danger of being lost forever. It is on record that over 50% of all film made prior to 1950 has been lost forever. Some of this was due to lack of care, resulting in fire and moisture damage. However, most was due to problems with projection. 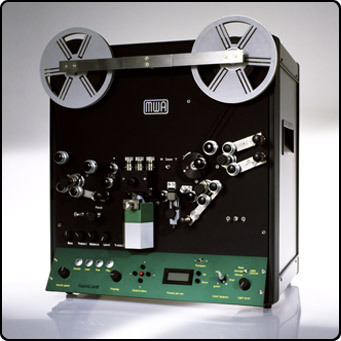 The introduction of telecine machines in the late 60's has saved a great deal of the films we are able to watch today, So if your future generations are to enjoy the living history contained in those reels, save them to digital. This is our premier service for any gauge of cine film and is recommended for archive material that is to be handed down for future generations to enjoy. Our Bosch telecine together with our specialist custom built gate produces the high resolution images required for modern television. Film is first is first removed from the original reels, which are often dirty or damaged. It is then cleaned and prepared for telecine. The Bosch uses a capstan/sprocketless drive and can be used to transfer film that can no longer be projected due to sprocket damage or shrinkage. Primary colour correction is also carried out if necessary to ensure the best quality digital master. If you have a DVD player it may be time to consider transferring your old videotapes to the safer DVD format. All video tapes are easily damaged. Accidental erasure, dirt in the recorder, or just poor storage can all result in the permanent loss of your images. 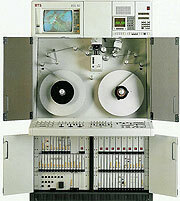 The machine on the right will clean, check and polish your tapes before transfer. Our professional machines incorporate a time base corrector, to ensure maximum stability and a drop-out compensator for damaged oxide coating, which are essential for analogue to digital transfers. We can also repair most video cassettes, please give us a call.